I hate to be the bearer of bad news, but somebody has got to let you know…there are giants in the land! The are everywhere! There are big ones and little ones. Wide ones and deep ones. Scary ones and harmless ones. There are all kinds of giants out there and guess what? You have probably conquered a few along the way. As our pastor explained last night, even when the Israelites entered into the promise land, God did not take care of all the giants. This goes back to the fact that God did not promise us a perfect and painless life. We run into giants at work and in the market place and sometimes even at church. They seem to just run about the earth causing trouble as they go. So what can we do? Create swords. Just like David killed Goliath with a stone, we need to figure out what our weapon of choice will be. 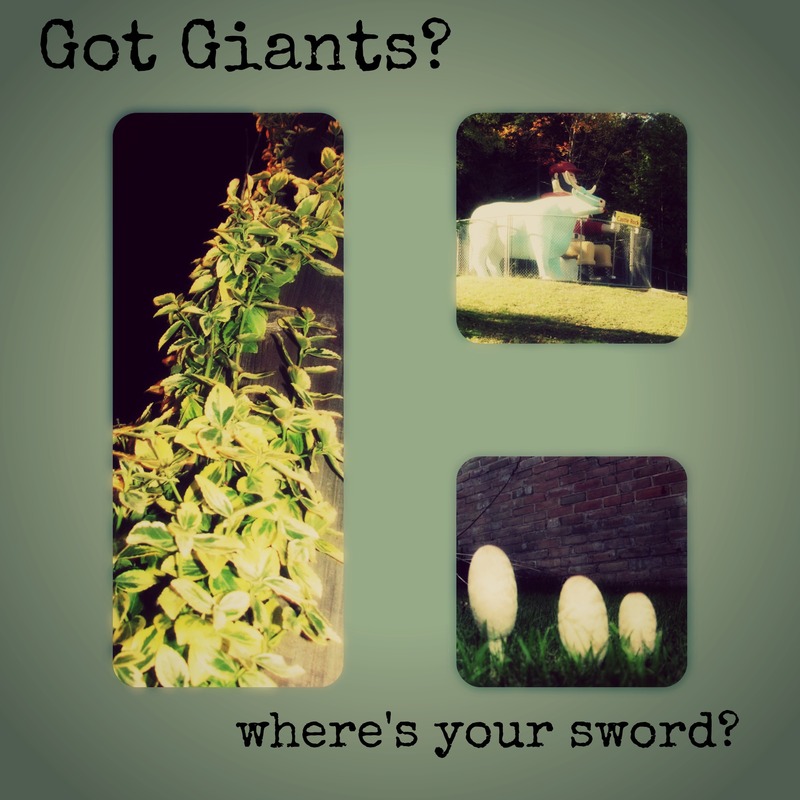 We need to decide what our giant is and then go at it with what we have been equipped with. For me it’s words. I actually have been discouraged in this area a bit lately and wouldn’t it be just like Satan to try to put a stop to my writing? As I went up at church last night for prayer, the pastor asked me why I gave it up. Hmmm…well the two books I have already written are going nowhere. I am not consistent with blogging and I feel as if I am getting nowhere or making any difference in anyone’s lives so why bother? Know what God told me? Do not give up and you are already well equipped. Those simple words relit my fire and passion to keep moving forward no matter what the devil is trying to tell me. So often we give up on dreams we have because we begin to believe the lies. Then we become trapped into thinking that nothing we do really even matters anyways so why are pushing so hard to make things happen? I encourage us all right now to evaluate that which is of God and press in. Seek to be strong in the Word and use it against the enemy. Giants are mere ants to God and when we have Jesus power on the inside, there is nothing which can stop us. Previous PostTrapped or Deceived?Next PostFire or Water?